Skyrocketing Chinese debts have made multiple African nations – most notably Kenya, Angola, and Zambia – “most vulnerable” to forfeiting control of key assets and territory to China, the global ratings firm Moody’s announced in a report this week. African outlets, citing Moody’s Investor Service, reported on Tuesday that those three countries, among others like Ethiopia and Republic of Congo, face significant risk of having to hand over control of major ports, railways, and other investment projects to China, a threat to their credit ratings as well as their sovereignty. All are heavily invested in China’s One Belt, One Road (OBOR) project, otherwise known as the Belt and Road Initiative (BRI), which is designed to give the Chinese Communist Party full control of the world’s most important transportation infrastructure. Other developing nations caught in China’s OBOR project have expressed growing alarm since last December, when Sri Lanka was forced to hand over a major port to the Chinese government after defaulting on a loan, essentially importing Chinese communist law to the island. In Africa, opponents of China’s “debt trap diplomacy” have complained for months of practices equated with colonialism, including pervasive racism on the part of Chinese workers imported to run the OBOR projects, “apartheid” systems to keep local African workers away from Chinese immigrants, and a refusal to offer Africans skilled labor jobs. Complaints about the Belt and Road projects have been loudest in Kenya, where a Chinese boss was deported for calling Kenyans “monkeys” and, this week, Kenyan authorities arrested three Chinese Belt and Road supervisors for allegedly stealing train ticket profits. According to a report in Business Daily, Moody’s warns that China’s presence in the continent threatens local assets generally, not just transportation hubs. The Moody’s report took pains not to attack China directly, instead advising, “in general, concentrated exposure to a single creditor, with little transparency about decisions to restructure the terms of the debt, increases rollover risks, weakening the fiscal profile.” Yet China is the only major national lender running a project as expansive as BRI, and the only one that has insisted on keeping the terms of Belt and Road debts a secret. 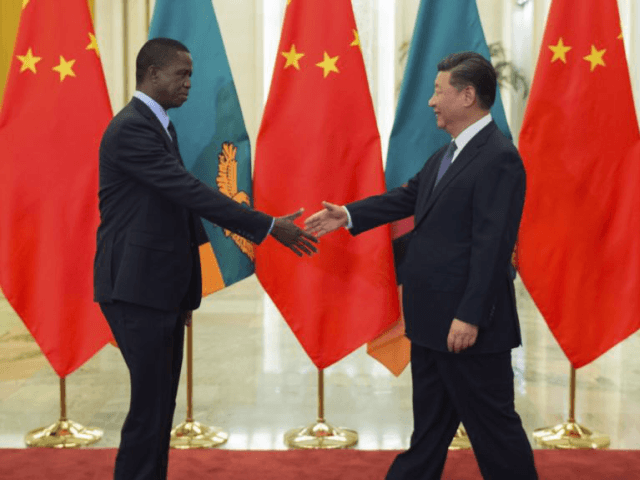 While the true number remains a mystery, China is believed to control up to a third of Zambia’s $13 billion national debt, adding another $30 million during a visit by President Edgar Lungu to China in September. Lungu’s government has repeatedly denied that it has borrowed more than it can pay. Yet reports that China had taken over Zambia’s state television and radio and concerns throughout the country triggered widespread protests from opposition leaders and local workers who feared their economy would collapse under the weight of so much debt. Zambian opposition leaders also accused Chinese workers of abuse against local Zambian workers, mostly working on infrastructure projects. Angola – which boasts one of the largest oil reserves on the continent – also added to its debt burden in October ith another $2 billion in Chinese financing for infrastructure projects. Kenya has caused the most international controversy among China’s African projects, however, in large part due to local media exposing horrific abuse against Kenyan workers on the part of Chinese imported bosses. The Chinese government flooded Kenya’s immigration system with disingenuous claims for tourist visas for hundreds of Belt and Road workers, denying skilled jobs to local Kenyans. Kenyans were instead hired to work menial labor for the Standard Gauge Railway (SGR), the largest BRI project in Kenya. At the job, Chinese bosses banned Kenyans from taking the same buses to construction sites, eating in the same cafeterias, and in many cases speaking to Chinese workers. Instructions for the project were all in Mandarin, ensuring that Kenya would forever be dependent on China to maintain the railway. This week, police arrested three Chinese nationals for allegedly stealing the train ticket profits China had promised Kenya would keep. The workers, according to anonymous sources speaking to Kenya’s The Nation, printed refunds for used tickets and kept the “refunded” money for themselves, netting the Kenyan government no profit. The nationals also face charges of attempting to bribe Kenyan officials into silence about the plan.